It was a country wedding with livestock barns, hay bales, corn throwing, and the boots to go with it! Kelli-Jo and Cole decided to make it official and get "hitched" at the very place where they connected years ago, the Grange Fair. There are a lot of special memories from the fair with tending and showing their livestock with their families. It was such a sentimental place, that they decided to make it their wedding venue. And though it was a first for us, Joel and I were happy to explore the grounds without thousands of people who typically attend the Grange Fair during it's time in August. We started the day with Kelli-Jo and her ladies. They strategically placed their campers in a box formation to give the girls some open space and privacy. All the bridesmaids were dressed in a fresh teal color, cowgirl boots, and carried dried flowers wrapped in burlap and lace to match Kelli-Jo's rustic wedding theme. The bride looked beautiful with her classic updo, sweetheart neckline, and long lashes. Although Kelli-Jo was dressed to the nines, she still kept it country with her own cowgirl boots and showing off her Grange Fair inspired tattoo on the back of her neck. Kelli-Jo happened to be reading over her vows before hopping into the truck with her gals to drive over to the cattle barns for ceremony time. Although Kelli-Jo and Cole have two sons and have been together for some time, there were still nervous butterflies before their "I do's" and some tears during the ceremony. It just goes to show how much they are still in love with each other no matter the time that's past. Right after their first kiss together as husband and wife, Kelli-Jo and Cole raced through the crowd as their wedding guests threw corn for their exit. This was an fun and very fitting spin on an old tradition! Afterwards, we plunged into family and wedding party photos. Everyone was in good spirits while going on our photography tour around the grounds. We even got a chance to drive out with the bride and groom to a scenic and woodsy clearing in addition to the barns. And we're so glad that we did! 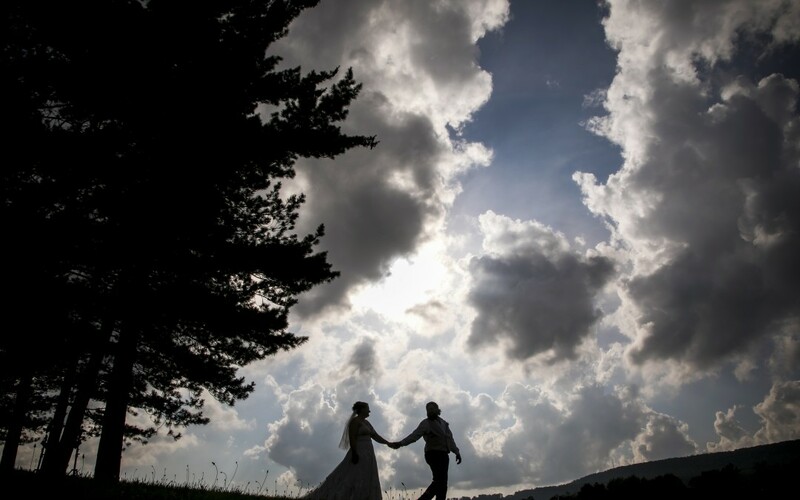 It was beautiful and we had such an amazing sky giving us the perfect end to our bride and groom portraits. i LOVE this idea. The venue is so much a part of their story. Great pix.